Yesterday, I say the Doctor Who Premiere in Theaters along with Behind-the-Scenes and a short Prequel. The prequel featured the Paternoster Gang, Madame Vastra and Jenny were trying to prevent a ship from crashing into London and Strax was updating his blog. He was explaining the regeneration (“degeneration” as he put it) of the doctor. I was hoping to see what was going on in the TARDIS but the prequel was still good. I missed a few things while watching the episode the first time. There was some whispering of questions and loud laughter but for the most part it was a lot easier to watch the show in comparison to viewing it at a bar. This episode has gotten me feeling that there are a lot of dark things a head for the Doctor and Clara. I’m not sure how I feel about the doctor but if the next episode is an indication then I think I’m really going to love this series! 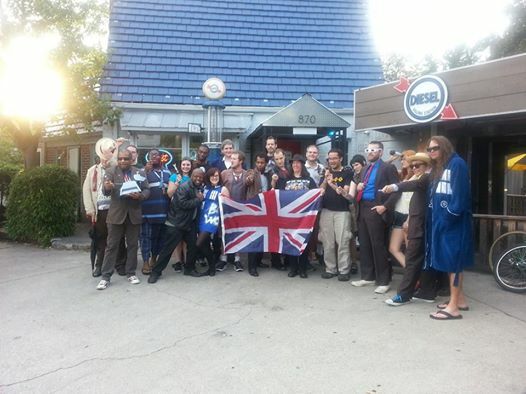 Yesterday I went to the DIESEL FILLING STATION to watch the premiere of Dr.Who. I started watching the show when Matt Smith was Doctor. I fall in love with the idea that all the Doctors personalities are fragments of the DOCTOR. I am trying to watch all the episodes starting with the original. I got past a few episodes (I’m at the Mayans) but am taking a break to get some real work done done. The episode was pretty good. I’m not sure how I feel about the new Doctor but as the 11th/12th Doctor said “Give him a chance” so I will do just that.